I had just entered the doffing tent, it was 7 am and the end of a fairly brutal night shift. There had been seven deaths in the day and two more overnight. That was my purpose for being in the red zone. Confirming death is one of the least enjoyable aspects of a doctor’s responsibility. Back home it takes a full minute, listening to the absence of heart and lung sounds, checking response to pain and examining pupils. It is something that legally needs to happen and I always try to carry it out with professionalism and brevity. Here, confirming death is increasingly harrowing. Patients prefer to lie directly on the concrete floor, maybe it is cooler, which then involves continuously washing off not only layers of dust, but dust caked in their own bloody body fluids. They lie, rigor mortis already setting in, in whatever position they happened to be in prior to passing. From an infection control point of view, a dead Ebola body is highly infectious and so we confirm with as little contact as possible. Confirm the patients name, hospital number, response to pain and pupils- done. Sometimes, even that feels like too much. This particular morning my grim responsibility was thankfully complete. 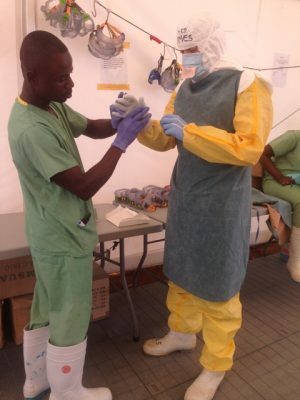 Shortly after this however, an employed Ebola survivor came running out of the suspect ward. The eight month pregnant lady was no longer pregnant. Dressed in full PPE (personal protective equipment), I once again re-entered the red zone. I retraced my steps to find a young mother alone on the floor, covered with a simple blanket. Lying on the same dusty concrete floor concealed under this blanket was a small ball of dusky skin in an increasing puddle of deep red blood. Now my obstetrics placement at medical school was a very long time ago and to be quite honest, it was not the most memorable. With my own heart rate rapidly increasing I was blessed by the imminent arrival of a far more competent national nurse carrying a birthing pack. With some hastily shouted orders over the fence, I scooped up baby and deposited him (yes – it was a boy) on to Mum. Baby was quiet and a little blue, now I had seen on television that if you give them a rather firm rub they start to shriek; which it did right on cue. Without any prior experience of what I was about to undertake I clamped the cord, cut it, delivered the placenta, checked it was all intact, gave her some oxytocin and massaged her tummy. After what felt like mere seconds the baby was wrapped up, the bleeding had stopped and mum was marched off to the shower. The whole experience actually went just as it should have done. Just as it has done for millenia, across the world, thousands upon thousands of times. This is what women do. They deliver their babies and don’t make a fuss in the process. Except this of course was not like all those other times because unbeknownst to this little bundle of joy, he had arrived into the world, in the middle of an Ebola ward. This is where people believe they come to die, not to be born or to live. He had not been delivered by a caring midwife or a close family member. His cord was cut by the double gloved hand of a nervous British medic in a suffocating yellow suit. Right now he was shrieking and kicking and doing his best to look like any other baby in the world. The reality is that Mom was a suspected Ebola patient and if positive then he was almost certainly positive too. A wondrous moment of life and hope had just happened in front of our very eyes, but the ever present reality of a deadly virus still dominated proceedings. In passing, I joked that Mom should call the baby James. We left the ward and made an extra special note to look out for the days results. Finally, the results had arrived. Negative. No Ebola. Not for Mom. Not for Baby. And the newborn boy now bore the official title of Doctor James Bangura. Today they will be discharged home with their Ebola negative certificates. I pray for baby James that his start in life will strengthen him to live a good, long and hope filled life. Having begun his existence in such desperate surroundings you might think that things can only get better.